As I am giving some VoIP services to little customers I have, one of the most important things on this telecommunication business is not only to find a cheap carrier but a reliable one. I can tell you I found Voxbeam. As a Voxbone reseller, It provides DID (phone numbers) from many cities around the world; and it gives fair rates for outgoing calls. However, there is a hidden trick I want to share with you. Voxbeam won't cut the call when you ran out of credit. For example, let's say you have 10 USD of credit with them. 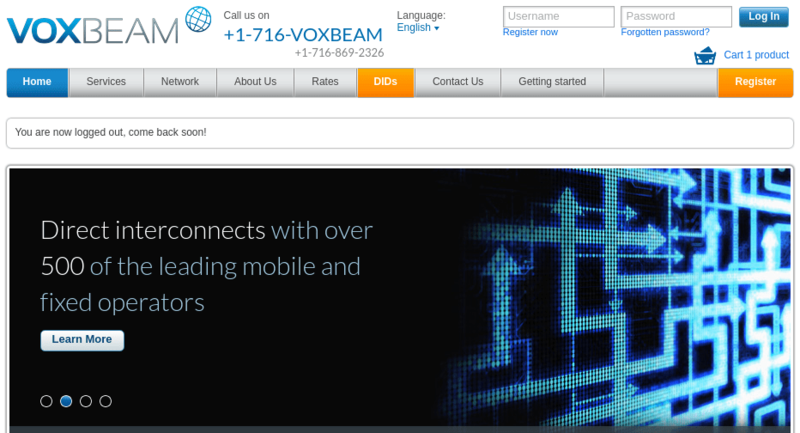 If someone in your PBX calls so long that he or she consumes 12 USD, Voxbeam won't finish the call when you reach zero credit, instead, it will allow you to call and it will give you a negative balance. At the end of that call, you will have -2 USD. This example is little one but now think on a big scale. You may loose a lot of money if you don't take your precautions about it. I have ticket them more than once asking to change this policy, and cut the call when there is no more credit, but they have refused by arguing they can not cut the service. To prevent more surprises, since one week ago, I have decided not to use Voxbeam for outgoing calls. I will use them only for incoming calls. Let's be fair, the DID's they provide are stable and not very expensive.